During the winter months our local farmer’s market shuts down. Star Hollow Farm, however, still has CSA pickup and some basics like their farm fresh eggs. The eggs they have are amazing and so much better than anything you can get in the stores, including fancy Whole Foods eggs. The eggs I get from them do not look like they came out of a factory, which I think is a good thing. They are a slightly different size, color and texture compared to regular eggs which are more like uniform obelisks. According to Randy at Star Hollow, they get their eggs from a farm just down the road from where the chickens run free and scavenge for food. The eggs tend to be fresher and the yolks have a brilliant orange color to them. It maybe physiological, but the yolks seem yolkier. You can tell how fresh an egg is by the egg white. 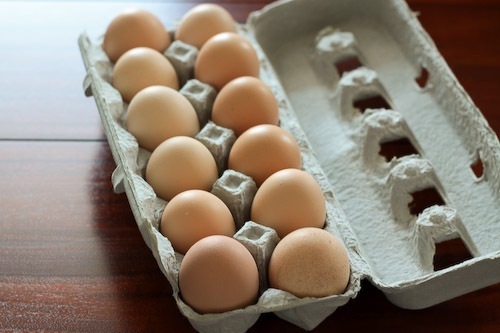 Fresher eggs have a slightly cloudy egg white that is thicker and “sits up” more. Older eggs have runny egg whites. As an egg ages water from the egg white cross the yolk membrane, enlarging and watering down the yolk. This makes the yolk more fragile…not good news for sunny side up eggs! You can test how old an egg is by placing it in a bowl of water. The older an egg is, the more the wide end will rise. This is because as an egg ages it loses moisture through its shell, which is replaced with air. All of these egg facts are courtesy of Harold McGee’s great book, On Food and Cooking. One last egg fact; while eggs are high in cholesterol compared to a comparable piece of meat, they are much lower in saturated fat. The interesting thing is that saturated fat has a larger impact on raising blood cholesterol than dietary cholesterol. 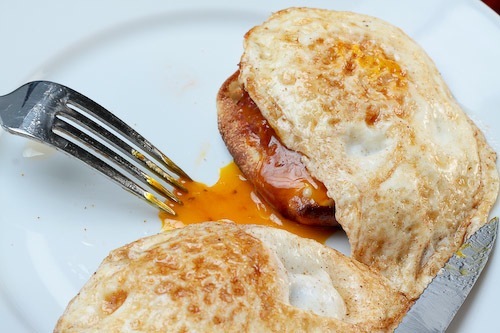 Other fatty substances in the yolk also appear to interfere with the absorption of the yolk’s cholesterol. So while you shouldn’t overdo eggs, there is no reason to avoid them! Carolyn and I have a weekly egg breakfast tradition. Every Saturday or Sunday we make open face eggs sandwiches. To make one, split an English muffin, toast each half topped with cheese, add salsa and then top each half with fried egg. The resulting breakfast “sandwich” is probably best eaten with a knife and fork. I have been cut off from my farmer’s market supply lately, and Whole Food eggs just don’t cut it. (And they have all these differently colored varieties that seem exactly the same–how do you choose?) Thanks for the shout-out, by the way. More Uganda pics to follow shortly. I am just jealous of your crazy travels! One of my friend was in Benin for the Peace Corp and I have always want to go over there. Interesting fact, there is no difference between brown and white eggs. It is pigmentation, sort of like skin color. At least I think, I should double check this. Can’t wait for the next round of photos! I agree completely! After you’ve had farm fresh eggs its hard to go back, even to the fancy eggs at Whole Foods!